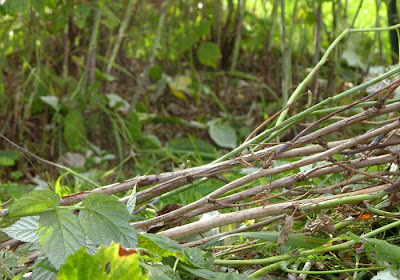 The asparagus harvest lasts from mid May until late June; after that the spears are allowed to grow and spread into a dense six foot tall hedge of ferny foliage that feeds and strengthens the roots. 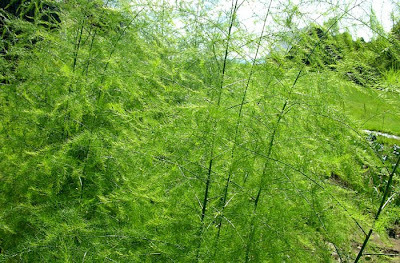 An asparagus bed in late summer is a frothy mass of delicate foliage glistening with light. To continue the theme of failure, here are three studies that I felt didn't work well enough to become paintings, though each in a different way. While working on the untitled sketch, I realized half-way through that it was bad: too many elements, with too many colors, an incoherent composition, and dull contrasts. I finished it, but didn't even save the photographic studies––hence the untitled––because I knew right away that it was a reject. I had a long narrow panel in the studio, 20 x 44 inches, that I ordered for another study that I found I didn't like several months after doing it. Two Circles was done for that panel. I was very excited when I first saw the motif: a new machine on a large dairy farm nearby. The strong red and black looked terrific. But later I felt that it was a more complicated design than I wanted. As in the case of Cord and White Circles in a previous post, though the image was quite interesting, it wasn't where I was heading with my work. The study I came up with for that panel is called Archimedes, and is shown in the post "The Long Rectangle: Painting Studies". It seems clear enough in its repeated rhythms to get at the real. White Towers has yet another story. I felt from the beginning that this image was a bit too metaphoric or misleading, too much leaning towards an architectural interpretation, as though we were looking at houses on a Grecian island instead of plastic. This bothered me, but I went ahead and started the painting, and here I'm going to admit to crass commercial motivations: paintings of mine that are white, yellow or blue tend to sell. Extremely annoying but true. But then my connection with my NY gallery was severed; I didn't need to please them, and I felt free. 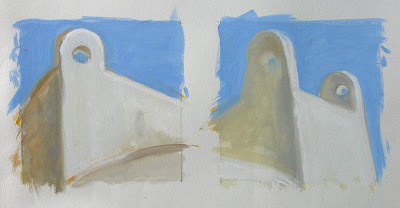 My first act of liberation was to wipe off the White Towers panels, going back to the blank white of the gesso ground. 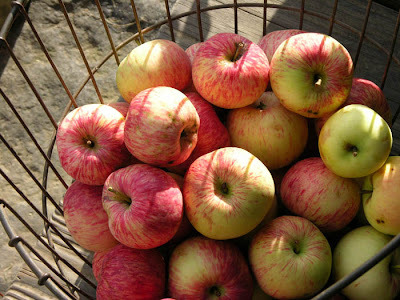 I just came in from picking some apples in my small apple orchard, which have ripened earlier than normal. The fifteen trees are all antique varieties that were planted many years ago. I was lucky enough to find a wonderful arborist, Padma Meier, who brought the trees back to life and health by careful pruning each year. Now I've taken over that job, which is very satisfying. 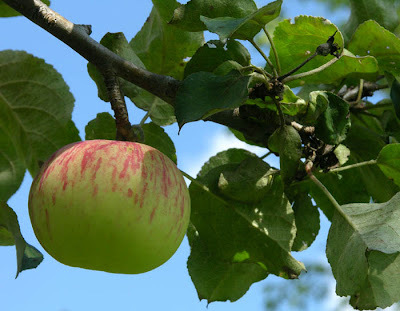 There are two varieties that are most numerous in the orchard, and most productive, though they bear only every other year: Duchess of Oldenburg, in the pictures above, and Peach apples, which ripen later in the season. Duchess are a great apple pie and sauce apple, with a nice tartness and crisp texture. I'll be making some apple butter tomorrow with those apples in the old basket. Peach apples are softer, juicier and sweeter, so I imagine they were planted for cider production. I've got three winter apple trees, but they don't bear well. Other varieties in the orchard are Sops of Wine and Sheep's Nose. These are not beauty queen apples: they're misshapen and blemished, but for cooking and eating at home are a real treat. I don't spray at all, so perfection cannot be had, especially in this wet year. I love having the orchard not only for its fruit, but also for its beauty; it is a connection to the past, and a continuation of tradition. 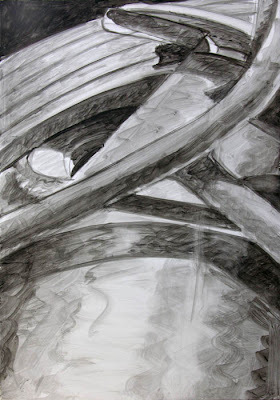 It is very traditional in egg tempera painting to do an underdrawing in ink. We can see this technique in uncompleted or worn quattrocento panel paintings. I've always done a tonal drawing before beginning the work in color. (I started this blog too late to show the underdrawing for Yellow Curve.) 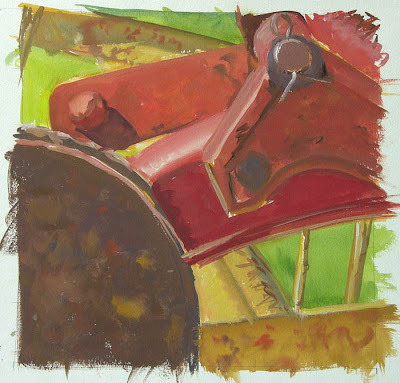 Because tempera is translucent, I find that having the values laid out is helpful, especially in the dark areas. For this painting and the previous one, I traced the outlines of the form in the color study and transferred the tracing to the panel. Before this, I had always done a careful pencil drawing to work out the exact composition and details. Now I find that I like starting more loosely, while closing the form as I go along. 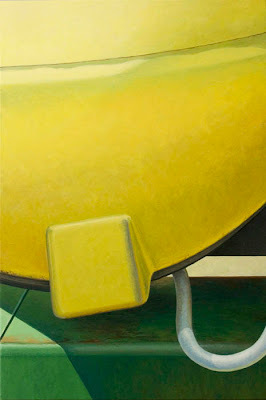 In the conversation I've had with rappel, on this blog ("Now Done", below) and by email, about the finished painting Yellow Curve, many new thoughts have come to mind. This post is inspired by her telling me of a scientific journal that was created in order to write about experiments that didn't work; it was thought that exploring the failures would help scientists in their work. It turned out that no one wanted to write about these unfulfilled experiments for a variety of reasons, and the journal didn't continue. In writing about Yellow Curve I wanted to describe my ambivalent feelings about the painting. I don't yet know its future, but the commenting regarding the cartoon and the comic has added a layer of meaning for me that wasn't there before....so thank you, blogging. But I have done paintings that I know are not successful, and after a suitable period of time, I erase them so as to re-use the panel. So I thought I'd expand a bit on my failures in the hope that it will elucidate my aesthetic and perhaps ring a bell with other artists. These two paintings (I consider the triptych Cord a single work) have a similar failing for me in that they both seem too bound up in the realistic as opposed to the real. OK, what do I mean by that? When a painting seems real, it has a weight and heft and tangibility; it exists in the world as a strong presence on its own, not just as an image of something. These two pieces are images of things, especially Cord, which we can see is a depiction of a bungee cord. All its detail, accurate and lively as it is, just calls attention to the source material. Painting as tour de force description no longer interests me. And in White Circles, the composition is too complicated: there's too much going on and the elements don't have an easy relationship one with the other. In my search for the simple and the concrete, these works were failures. I like to think of Kant's phrase "the thing-in-itself", which in my limited or mis-understanding, points to a reality beyond the visual world and beyond our understanding. I like to think of painting as pushing us past primary visual responses towards a deeper and more elemental awareness. The very chilly and wet weather that we had until early August did terrible damage to my tomato plants. The transplants looked wonderful, with nice thick stems because I'd made sure to put them into larger pots as they grew so their roots would happily spread out. But then the weather just didn't warm up; there were days in the 50s and 60s, which should have been 70s and 80s. This is great for greens and cabbages, but warm weather crops struggled. 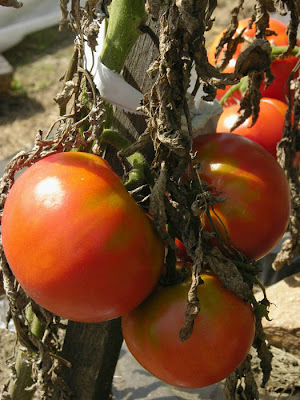 Tomatoes are especially susceptible to early blight (see the dead leaves on the Cosmonauts above), but usually the plants grow vigorously enough to outrun it. 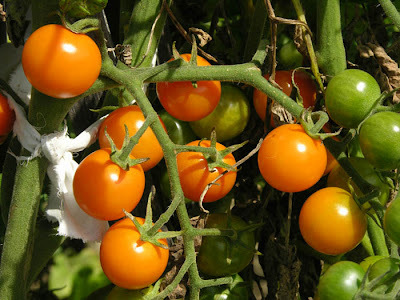 Sungold, that intensely flavorful cherry tomato, always seems to manage this. But all my paste tomato plants, which are determinates––Romas––are dead. Yes, there are some red tomatoes, and I'll be able to make a few pints of sauce for the freezer, but I won't have enough for canning. Last year's rainy summer, though warm, also stunted the tomato crop. Sometimes I worry that climate change is bringing this very wet weather to the northeast and that it's here to stay. Yesterday and today have been beautiful crisp autumn-like days. Perfect for doing yardwork. Since the raspberries have finished bearing, I've been working on pruning the canes, which has to be done each year at the end of the season. I cut out the old canes and thin the new ones, weed the beds and rototill around them. Then I put hay mulch around the plants; this keeps down weeds, conserves moisture, and provides some nutrients to the soil as it breaks down. Yes, this is a lot of work, especially since I have two broad rows of plants, 2 1/5 feet wide by 24 feet long. When I first moved here 19 years ago, there was a huge round mass of raspberry canes and weeds. Over a few years I wrestled the plants into order, making these long rows. Every bit of work has been worth it as I harvest gallons of gorgeous delicious berries each year. The next painting on my easel will be based on this study, painted on a farm up the road in June. 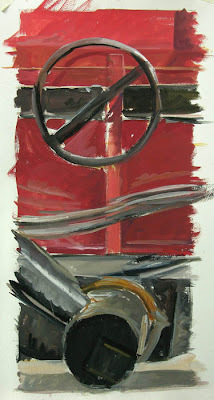 I loved the big sweep of red, crossed by shadow and by tubular forms, and backed by black. I did another small red and black study this summer, and my mind kept reciting "the red and the black", the title of a 19th century novel by Stendahl. In that case it was referring to the church and the military. There's no color symbolism here. 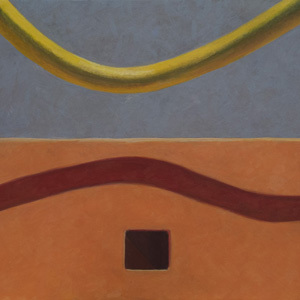 This painting will be similar in feeling to Yellow Curve in its use of a big simple form playing off some smaller elements. They are similar in format, with this painting a bit bigger at 26 by 18 inches. I don't think I'll be doing a detailed step by step with this (unless by popular demand), but will describe the process from time to time. I love parsley. It's a vigorously growing, nutritious herb that adds a bright flavor to salads and sauces. It's also the primary ingredient in a food that I grew up with: sandwiches of "ejjeh badounness" in pita bread with a slice of beefsteak tomato. My family are Sephardic Jews from Syria, and my mother is a great cook of that cuisine. 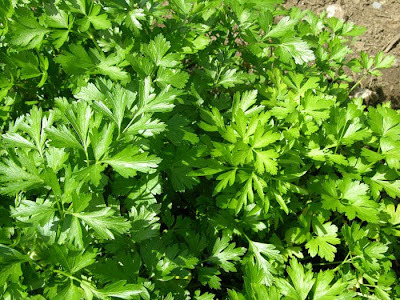 This is one of my favorites for summer when parsley is abundant. It's a popular item for vegetarians at potlucks. So I'm sharing the recipe with you. 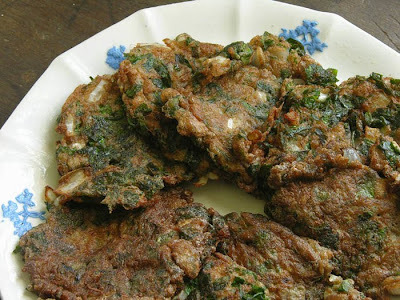 Mix onions and parsley with the eggs, making a thick batter. Add salt and allspice. Heat oil on medium flame. Drop batter by large spoonsful into oil and cook till brown on each side. Drain on paper towels. Enjoy warm or cold, plain or in sandwiches. It's become so gloomy today: light showers outdoors, lights turned on against the dark in the kitchen. And it's cooling off quite a lot. 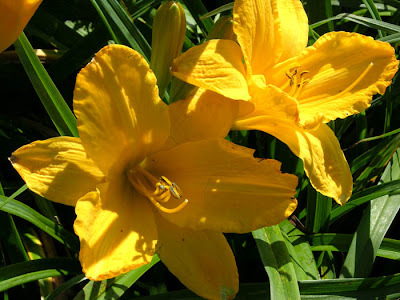 So I thought I'd post these daylilies, which I photographed earlier in the month, to ward off the blues. 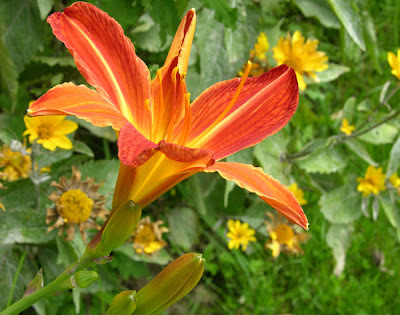 Daylilies come into their own in August, in their myriad forms and colors. They are the perfect plant guests: never demanding, always well behaved, and lovely. 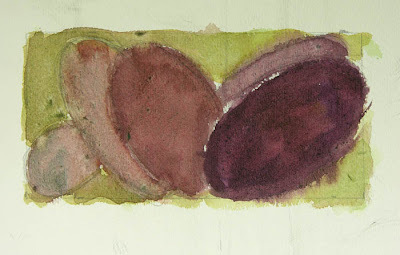 A few days ago, in the post "Dyeing Day", I showed the watercolor sketch for my new rug hooking project, Tilted Ovals. After finishing dyeing the wool, I had to make a full sized, 10 x 20 inch, drawing on paper that I would use for transferring design to the linen backing. 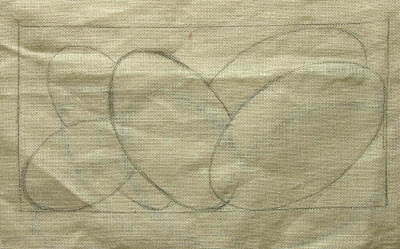 Because the linen is transparent, I can place it on top of the drawing and trace the design with a soft pencil. Then I have to cut the wool fabric into strips for hooking. 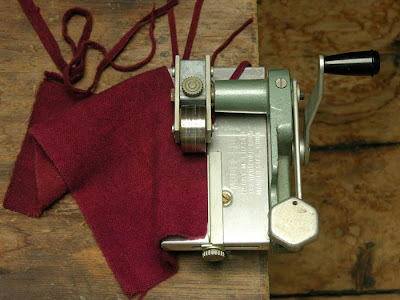 I use a Fraser Cloth Cutting Machine, which has a cutter wheel under the wheel you see on the left. As you feed the fabric into the machine, it is squeezed between the upper and lower cutter wheels, and cut. The cutter wheels come in different sizes, for cutting wider or narrower strips. I use a #6, which is 6/32 of an inch: 3/16. For smaller works, I sometimes use a #5. Here's a detail of the work just begun. With the wool strip held behind the linen, which is stretched over a frame, I reach through with the hook and make a loop of the wool. Over and over. This seemingly tedious task is actually very relaxing and I enjoy sitting and doing handwork, usually in the evening in front of the tv. The choices at this stage of the work, since the color is now fixed, are in the direction of the hooking. With the geometric ovals, I've decided to follow the curved form, while the background will be randomly hooked. The small openings of the woven linen allow for multi-directional hooking. 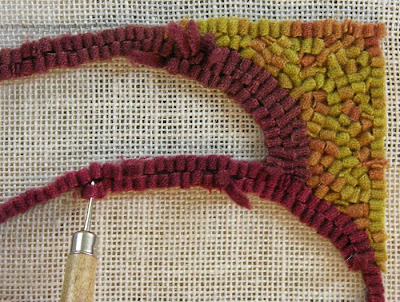 Since the work on a ruglet is so straightforward, I won't be doing an "in process" series. But I'll share the project when it's done. Late in August in Vermont, we have extravagant days like today which are so beautiful, yet point to the end of summer. 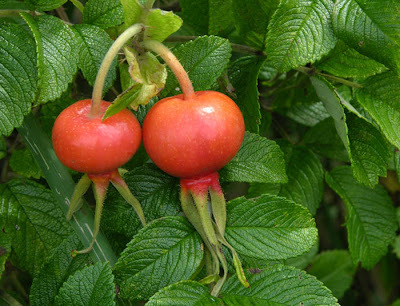 Insect song is rising to a crescendo, the sunlight is angled lower, rose hips are ripening. When I look towards my vegetable garden, it shows the height of summer fruitfulness, with tall sunflowers and corn stalks and wandering squash vines. Summer phlox and rudbeckia color the mainly leafy flower borders. But a cold front is heading this way for tomorrow, with "modified arctic air", so today I have to breath deeply of the warm air and take a delighted pleasure in it all. Scumbling the lighter colors over previous layers did the trick: the surface of the painting now has some fluid brush work, that flows evenly enough to describe the form. I like the way the yellows at the upper edge of the shadow appear translucent while the lower color is opaque. This effect echoes the way the original object would catch the light. I managed to get a sense of volume; the center of the form illusionistically curves toward us, so the yellow curve is not only a side-to-side movement. The image in this painting is rather odd in it's massive simplicity. When I work on paintings, there are those that I love throughout the making of them, and others that I feel uncertain about. This painting, with its strange composition and aggressive form, is one of the latter. I'll have to live with it for a while; I'll grow to love it or not. What do you think? Update: I want to be clear that for me these doubts about my work are a good thing; questioning negates complacency, and can lead to growth and change. Today was one of those days, when I think I've finished my painting; then, after a break, and after hanging the painting on the wall (to get a different perspective on it from the easel), I realized that no, it sure wasn't done. It looked terrible to me. 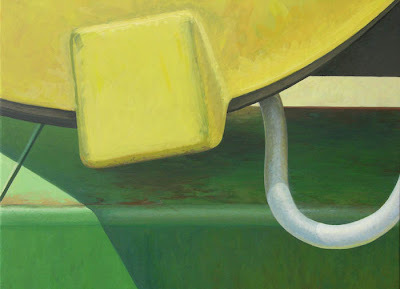 Here I have to say something about the difference between seeing an actual painting and looking at a jpeg online; because the painting looks just fine here, you are probably thinking I'm too finicky etc. Looking at the real physical painting provides a more visceral experience; you can relate more to a human-made mark, to the presence of the paint. These marks get evened out in the photo process, and further flattened online. Online we see image, not paint; light, not paint. I had worked a lot on the lower part of the yellow form, glazing darker yellows––some greenish or reddish or blueish––over a lighter tone. I put several layers down till I got the color and brushwork that looked effective in describing the form and light. When putting a darker color over a lighter one, which is glazing, the brushmarks are more evident, and can get jangly looking. When I worked with cross hatching in the past, the deliberate nature of the mark making made glazing with thin layers of color easier. Even though it seems harder, cross hatching in its predictability is more straightforward. It was very helpful for me to hang the painting on the wall, because then I saw that it didn't have the quality of light that it needed, and the overall value was much too dark. So I went at it with a lighter value. You can see above where the lighter yellow color has been scumbled (which simply means putting a light value over a darker one) on the painting. Scumbling evens out the tones, which is what I think I need here because I wasn't happy with the brushmarks. I hope to finish doing this tomorrow, but there are always surprises in the studio. 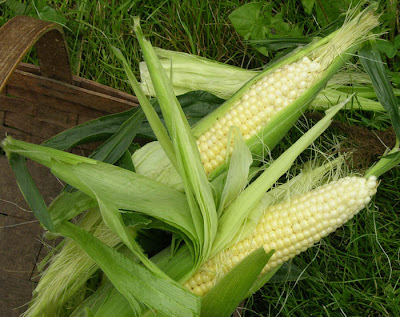 The early corn, a variety called Spring Treat, is finally ripe, about a week late. I got some water boiling and went out to pick two ears for lunch. Corn rolled in butter as appetizer, then a fried eggplant sandwich, steamed green beans and tomatoes, all fresh from the garden, with just-picked blueberries for dessert. Is this heaven, or what? Since the weather had cooled off a bit yesterday, and the forecast was for showers and thunderstorms, it seemed like a good day to get out the dye pots and dye wool for a new rug hooking project. The working title is Tilted Ovals. I start with thumbnail sketches (I have hundreds of them) of compositional ideas. If there's one I like, I do a small––this one is 3.5 x 7 inches––watercolor sketch. This gives me guidelines for color, but just guidelines because as I explained in the Tiles post, dyeing is a unpredictable process. I did a full sized drawing so I would know how much wool I needed for each color; a rule of thumb is 4 times the area of wool for each shape; a 5 x 10 inch shape will need 20 x 10 inches of wool for hooking. 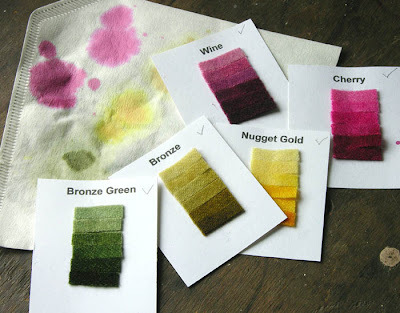 Then I look through my swatch book of Cushing Dye samples to find colors that will work for this piece. 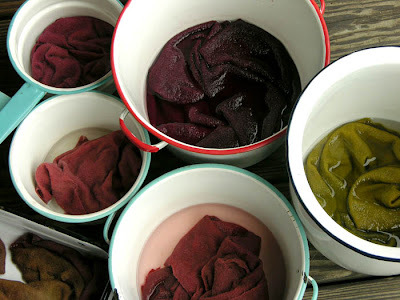 These are acid dyes which are set using some white vinegar in the dye pot. 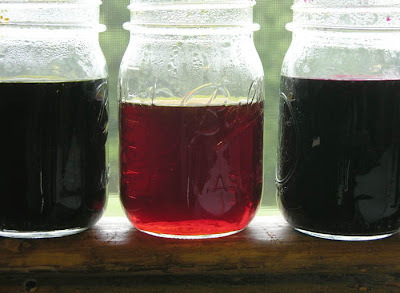 I often mix colors in the jars, but for this project I mixed up strong dilutions of 4 different colors, adding different colors in different amounts to the dyepots to mix color. It's a bit of a seat-of-the-pants operation. That reddish looking liquid in the center is actually the nugget gold color. So I dyed all 6 pieces of wool, rinsed and spun them in the dryer, and then found that the color was too way off on several pieces for me to use. The reds were too sharp (too much cherry probably) or too bright. So I had to dull them with some green, since green is the color complement of red. I pulled out some bronze green dye and mixed it up, then added it to the boiling water with vinegar. I redyed 4 pieces, and that did the trick. 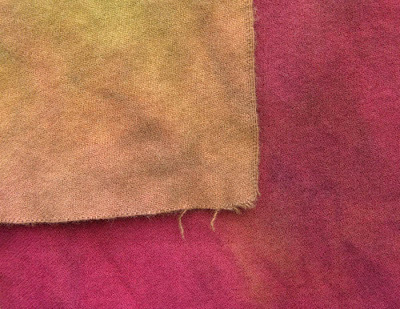 The dry colors of the wool aren't at all copies of the watercolor sketch, but dye and watercolor are different mediums and different kinds of color. I think these hues will work together in an interesting way. The background yellow-green color is more intense than I planned, but I think this contrast will add some snap to the image. I had plopped the yellow wool into a pot with red cloth and it got some spotting of red color; this was not planned, matter of fact it was a mistake, but I thought that it might work well. When you look at these photographs (the bottom photo is a close-up) of the dyed wool, you can see the lovely subtle variations in value and in hue that come from hand dyeing. 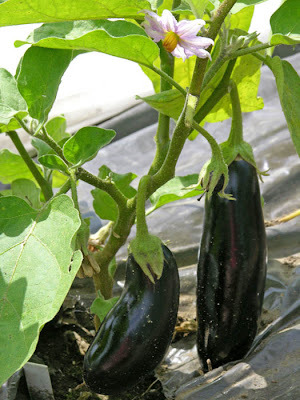 Eggplant is not an easy crop to grow in northern Vermont and I love eggplant, so I have to choose varieties that will ripen here; I also grow the plants on IRT mulch, which is a black plastic that allows infrared light through to warm the soil. Growing this heat loving plant under a row cover also helps. This plant is Diamond, which ripens clusters of long narrow fruits. I've had really good luck with this variety, which I get from Fedco, a wonderful seed company in Maine; they have many varieties for northern climes. Last night I fried up slices of eggplant in good olive oil and ate them in homemade pita bread. Delicious. I realize it's mostly like eating olive oil sandwiches, but still it's wonderful. I also like to make eggplant salad, a middle eastern recipe: cook the eggplant directly over the flame on the top of the stove till blackened all over and very soft. Then scrape out the cooked flesh, or which will have a smoky flavor; some bits of skin are fine. Chop, season with olive oil and lemon juice, and add some chopped parsley, and if you have on hand, some sweet pepper, tomato, cucumber. 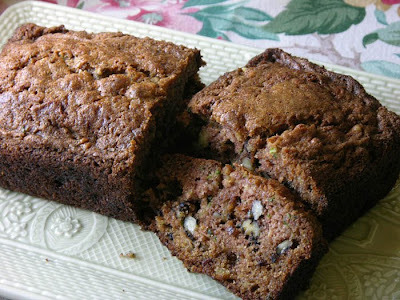 This morning I made the first batch of zucchini bread; it keeps very well in the freezer so I like to make a few loaves while the zucchini is coming in fast and furiously. Whenever I've offered this recipe to guests, or taken some to a potluck, it's gotten raves, so I'm going to share it with you. The only downside of this recipe is that it doesn't use enough zucchini: only a couple of mid-sized or one large fruit. 2. Beat eggs lightly in large bowl; stir in oil, sugar, zucchini and vanilla. 3. Sift dry ingredients together, stir into egg mixture. Stir in raisins and walnuts. Spoon batter into two well greased loaf pans. 4. Bake at 375 for 45-50 minutes. Store or freeze wrapped in aluminum foil. During the past few days of hot, sticky weather, I've been lucky enough to be able to walk down to the small pond in front of my house for a quick dip. Getting wet completely changes my attitude on the day; from feeling slow and heavy, I feel energized and happy. I go to work in the studio in my damp bathing suit, a cooling costume. As I was working on the upper part of my painting today, I was thinking a great deal about light, and about getting a convincing depiction of different kinds of light. There is light and there is shadow or half light, but shadow also carries a great deal of light; it is not absence of light. Then there are cast shadows, which tend to be cool in color. 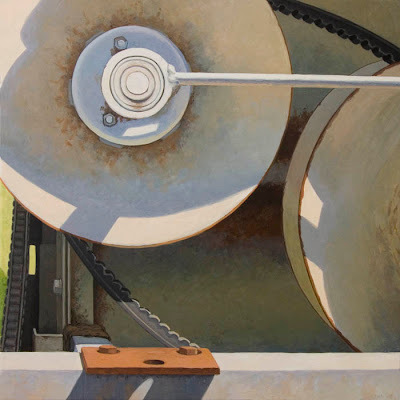 When out painting from "life" (if I can call painting a machine on site "life"), I often make a small frame of my hands so that I can see the shadow color in isolation; when the sharp contrast with light is removed, the color in half light shows bright and clear. 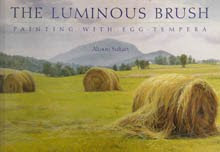 In traditional painting, the lights are generally opaque and shadows transparent. I don't always follow this model, but in the case of painting this yellow plastic tank, this curved form, it works very well. I painted several layers of light yellows on the upper left; starting with very light tones, I glazed darker ones, then back to light, then a bit more saturated color, till I got a light but bright area. I wanted a sense of opacity, but with a lively touch. I've begun to get what I want in the lower shadowed but translucent areas: a rich darker yellow giving a feeling of light coming through the surface. (if you look at the enlargement, you can see some unfinished layering in the lower right.) This comes from glazing more saturated color over lighter tints. A word about brushes: I generally use synthetic sable brushes, finding they work very well for me. A good quality synthetic will give a fine point and hold up very well over time. 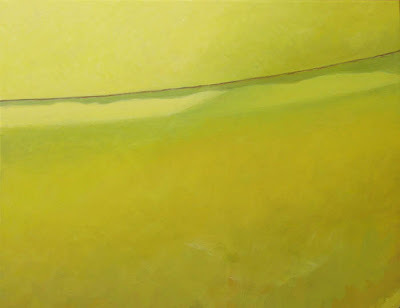 When I'm painting large areas such as this yellow, I like to use filberts of a mid-size, around 1/2 inch. They yield a beautiful mark, somewhere between the flat and the round. Most of the time, though, I use rounds. 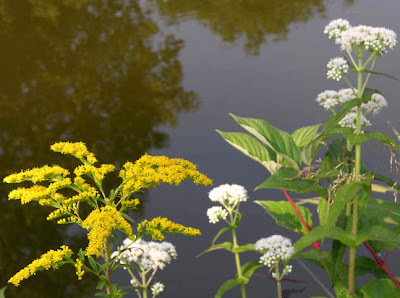 Even though my flower borders begin to look a bit disheveled by mid August (their height of bloom is in June), there are flowers coming into bloom while cicadas buzz and robins fly south. 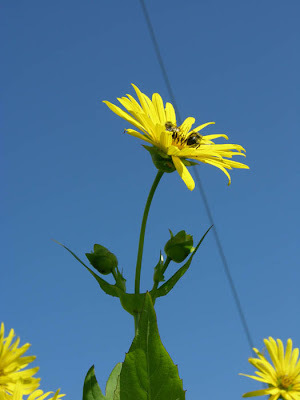 Rosin weed is a magnificent, 8 foot tall plant that is a spreading clump beside a telephone pole. Some years, the deer eat a lot of it before blooming because it's outside the protection of the electric fence. This year they only had a taste, so there's lots of cheerful yellow in view. 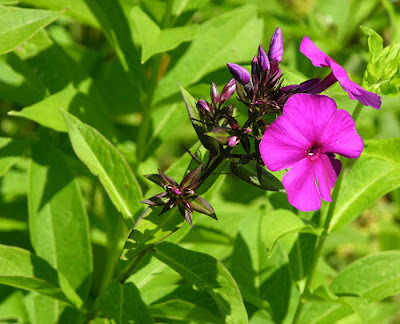 Phlox is, of course, a mainstay of the summer garden. Here, beginning to bloom, is a stunning cultivar named Nicky, with intense purple red coloration. I have a lot of trouble growing beautiful phlox because my borders have very wet soil, caused by lots of rock ledge under the ground. Part of the cellar in my house is filled with ledge, and rocks grow out of the soil every spring. 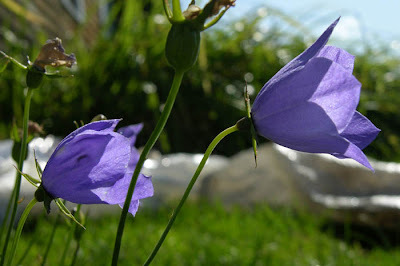 Campanula Carpatica "Blue Clips" is a small mounding plant that is very happy growing in front of my porch. It has reseeded itself profusely in this area. When I tried growing it in the front of a border, it wasn't at all pleased: too wet. Plants certainly let you know their likes and dislikes very clearly. 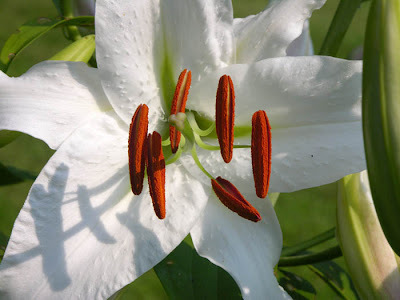 The Casa Blanca Lilies just began to bloom. 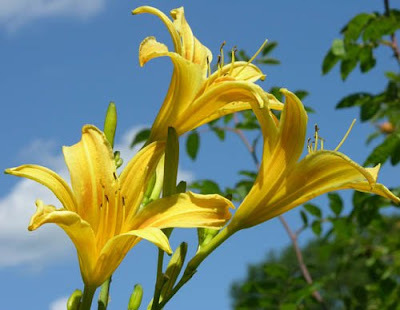 They add a rich and heavy scent to the garden. I love the way their huge stamens make a strong graphic statement, like insistent brushmarks on a blank canvas. In this time of high summer, the world is full of the color of flowers, fruit and leaf. In the woods, mushrooms shine out in their varied tones. 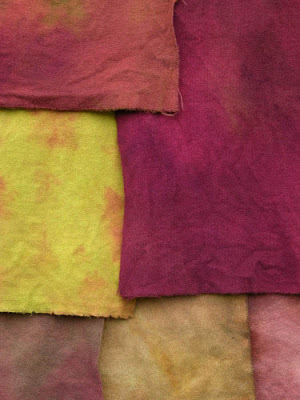 Humans gathered colored earth to make images eons ago, and used plants to dye cloth. Now we have those natural colors at our command, in addition to many manufactured ones. It's thrilling to walk into a shop selling pigments, to see all those colors glowing from shelves. 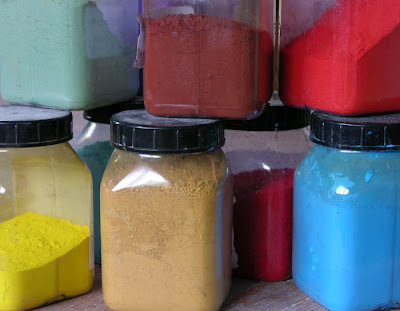 The powdered pigments in the jars above include natural earth colors, inorganic, mineral, and cadmiums. These colors are made by Kremer Pigments, who also carry a wide range of historic pigments, such as malachite and lapis lazuli. I grind the pigments with distilled water, keeping the prepared colors in glass jars, ready for use; how much more beautiful they are in jars than hidden in tubes. 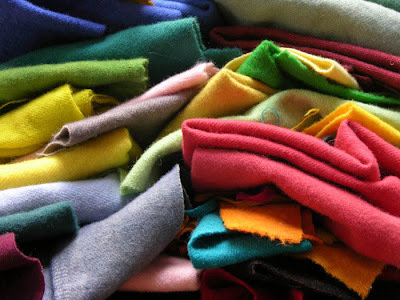 The piles of colored wool are leftovers from various rug hooking projects. I have masses of small pieces of dyed wool, which I sometimes use for inspiration, placing odd colors next to one another to test their harmonies. This human-made color is lushly gorgeous. I went out to the garden this morning to pick a couple of zucchini; smallish-medium had turned into medium-largish overnight. And a few other fruits had ballooned as well. What a plant! 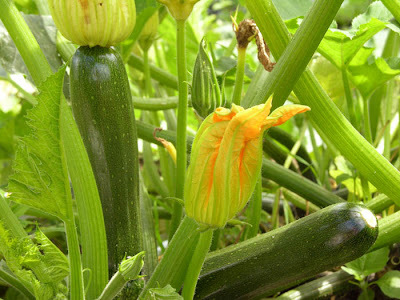 From a hill of just 3 zucchini plants, I get a seemingly endless procession of these elongated beauties. Luckily, I love zucchini, cooked every which way. Tonight I'm going to make a pizza with fried zucchini and eggplant, and some cherry tomatoes, mozzarella and basil. 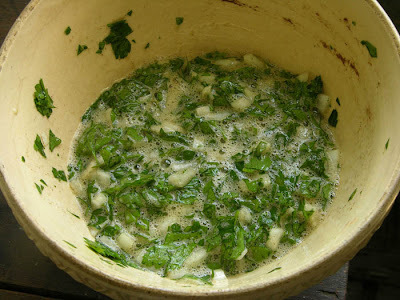 My favorite way of making fresh zucchini is from Marcella Hazan, sauteed zucchini with oregano. Start with lots of chopped garlic in a good amount of olive oil in a wide skillet; when the garlic starts to color, add thinly sliced zucchini and cook at lively heat till zucchini is soft and starts to brown. There's also a nice middle eastern recipe which I grew up with, a zucchini pie/omelet. You cook sliced onion and zucchini in butter till very soft, then add eggs and grated hard cheese; I use cheddar, my mother uses muenster. It's baked in a pan, in a medium oven, till brown on top, and served with yogurt. And of course there's cream of zucchini soup, and zucchini bread (which I'll make when the weather cools a bit and post the recipe) and freezing, and, inevitably giving some away to gardenless friends. During these finally warm days of summer, bees have been actively moving through the garden; as I pass the mass of melon foliage, dotted with flowers, the bees are zipping from bloom to bloom. Looking into squash blossoms, bees are deep within their throats. After years of worrying about the declining bee population from colony collapse disorder, it's a thrill to see so many of these essential insects. Each time I see bees inside the female flowers of vegetables, I'm thrilled: ahh, that squash will be pollinated and grow. 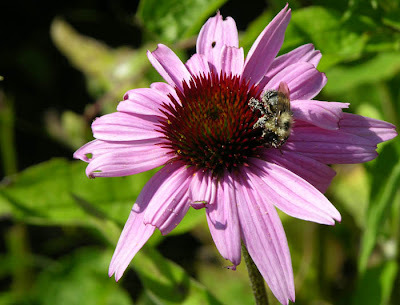 Watching the bees crawling into lips of bee balm or across the stamens of other flowers, covered with pollen, they seem in a state of ecstasy, reveling in their harvest. I reworked the transition from horizontal to vertical planes in the curve, trying to make it smooth and believable, and less abrupt. I had to add some subtle darks along the edges of the curve, and lighten the color at the front of the horizontal plane. It looks a lot better than at the end of the last session. I glazed some ultramarine blue on the edge of the diagonal shadow, which I think makes the light more convincing. The white hose is done, I hope. And I started adding yellow color layers to the bottom of the tank. It'll take many layers, going back and forth from lighter scumble to darker glaze, to get the color right. 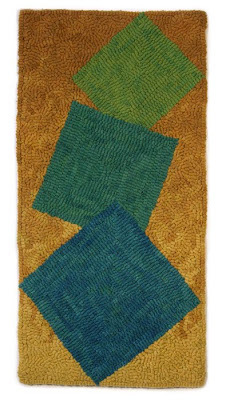 Cascading Squares is a 20 x 10 inch work, with squares tilting and moving forward in space. The illusion comes from bigger square to smaller, but mostly using color, value and contrast: the most intense and darkest color square pops forward with its contrast to the lighter background. The smallest greenish square, although the warmest color, sits back because its value is close to that of the surrounding color. To get the gradations of warm yellow/red in the background, I dyed the wool by dipping it into the dye pot, in and out, more on one end for a darker color. At the end of the process, I added more red hue to the pot to get a color transition in the darks in addition to a light-to-dark one. Throughout the wool was scrunched into the pot so that the color would be variegated, which I think adds life to the hooked work. I finally finished this piece a couple of days ago (I don't work on ruglets as much in the summer heat) and am working on studies for a new one. I hope to dye wool soon and plan to post on the process. Each morning when I renew my sourdough starter, I am harvesting wild yeast from the air around me, a Northeast Kingdom sourdough. So I suppose breadmaking with sourdough could be considered a form of cultivation . A few years ago, my friends Helen and Jules Rabin of Upland Bakers decided to retire. This left me bereft: no more of their marvelous pain de campagne. The thought of learning to make sourdough bread seemed overwhelming at the time. But then I met Jeffrey Hamelman, the director of the bakery at King Arthur Flour, at their home. He asked if I fed my dog every day, and pointed out that keeping a sourdough culture was just like having a pet. So, I took a very helpful class at King Arthur, and have gone on to make bread every week. 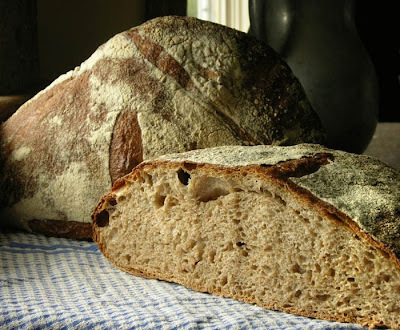 The recipe I use is an adjusted one from Hamelman's book Bread: a mixed flour miche. You need only 1.3 oz, or around 3 tablespoons of starter to make a levain for a 3 1/2 lb loaf, which means the starter is very vigorous. The dough is quite wet, so yields a dough with chewy texture and open crumb, great keeping quality, and delicious flavor. I love cucumbers fresh from the garden, when they're still warm from the sun. Their flavor is mild, with a crisp crunch in the eating. 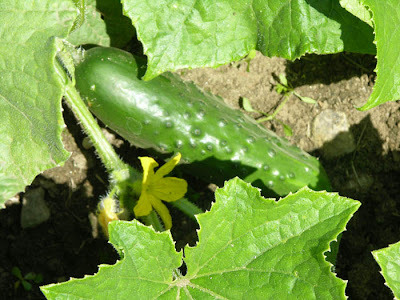 Cukes lend themselves to summery eating: sliced cucumbers with yogurt, garlic and mint; cold cream of cucumber soup. It's finally warmed up enough to have a longing for these brisk foods. 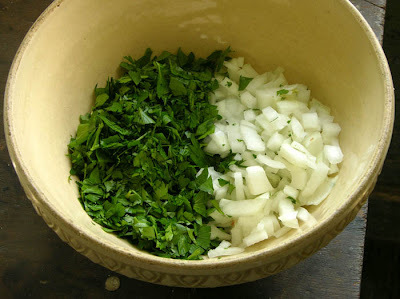 The soup is easy to make: 4 chopped cukes and a chopped onion are cooked in 4 Tbs butter till the onions are translucent. Add 3 Tbs flour for thickening, then a quart of water or chicken stock. Cook for 15 minutes, and when cool puree in a food processor; add some cream, or milk, as I do. This works for lots of vegetables: zucchini, broccoli, carrots etc. I often make extra for the freezer.